Every Indian is familiar with these cute brittle candies made with Jaggery/Gur & nuts (peanuts, cashews, almonds..), sesame seeds, puffed rice or even dessicated coconut, peanut/groundnut being the most common of all. When we were kids, this was one sweet sought after treat we could easily afford with our pocket money. I remember these being available at every street corner vendor, & we would run down to the stores & buy these little rectangle pieces wrapped in clear wraps for 25 paisa a piece. My grandma & my ma would frequently make these at home, at our requests & I remember looking over in the pans to see Jaggery melt, the peanuts quickly added to it, mixed & the entire goop scooped out quickly & spread out into a layer… I would persistently stand by for as long as it took to make it, & then touching the spread to see if it cooled down. It did pretty soon & it was time for the treat. Note: Jaggery is available in Indian Groceries. I you find this is the form of a big hard block, put the jaggery in a bowl, & put it in the microwave for about 15-20 seconds. All microwaves operate differently. Make sure it does not melt. Take it out, & press down to see if it crumbles. If it does not, microwave again for a few seconds.. till it crumbles under pressure of the palm. Alternatively the Jaggery may be grated before melting it. Very lightly crush the peanuts in to big chunks but not powder. Some will still stay halves. Put the Jaggery/ Brown Sugar & Ghee in a large pan & heat at low-medium heat. Stir until the color changes to golden brown. Traditionally it is tested for doneness by dropping a bit of the melted syrup in bowl of cold water. If it solidifies right away, it is done & time to add the peanuts. It can also be tested with a candy thermometer. Let the Thermometer heat up 250-260 Degree F.
Add the peanuts & the ginger powder if you are using, & mix well. 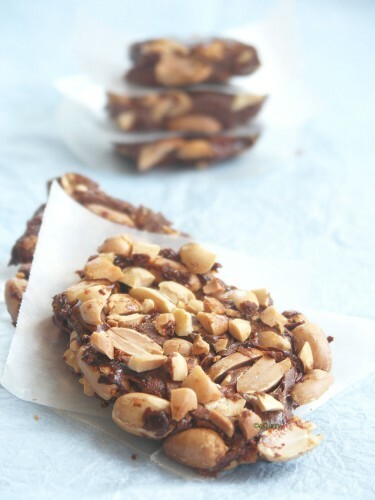 Place the mixture on the parchment/wax paper/foil, flatten the mixture using a rolling pin to a ¼” thick slab. Sending these bars to the MLLA #10 : Starters & Desserts hosted at CoCo Books, the event originally being started by Susan of the Well Seasoned Cook. Quick, & Easy bars stirring a lot of childhood memories. This is the first time I made these at home. They were thoroughy enjoyed by my family & me. I think I should be making this more often! The bars are on their way to Homemades #3: BARS. This bar can be customized .. & anything (grains, seeds, different nuts) you want may be added to it. The Jaggery acts as a binding agent, & it much healthier than refined sugar. Besan ki Barfi – A Chickpea Fudge? They look too good. thanks for sharing. These look delicious, I love peanut brittle! I’ve never made it at home before. Sara I love them too & this is the first time i tried them. But will definitely make them again! Alka they turn out just fine without the ginger powder:-D.. it’s just optional. some like it some don’t.. I actually prefer the one without myself. I remember my aunty making these for us. Very tasty indeed. Probably the large scale availability here has been responsible for my not attempting it at home:). Yours look tempting! They look so good Soma. Did the kids enjoy them? I be they did. looks yum soma! some friends came from India last month, they got some chikki, though i bet the homemade one must be a lot better! My mom used to make ladoos, we used to ask her to make chikkis. So she used to make half ladoos and other half chikkis.. Only eating that was our fav past..Yumm..Thank you for reminding it.. I have never seen the ladoos.. nice idea. This is my fav too…and i think most of will be nostalgic about this chikki.. Nostalgia forces us to create a lot of things:-D which i think is really good! I love this! BTW, the jellied tomato salad looks quite good. We found our agar-agar in the Indian store, Soma. It should be there, I think. ginger pow sounds good in those bars 🙂 They are perfect! It’s great that you can make these at home. We have a simialar snack in Turkey still with peanuts, but I think they stick them together with honey. They probably taste different, but now it brought my childhood memories too. They look similar. These are sometimes made with sugar too, in India. Honey is a healthier idea, but I just love the jaggery. Great entry! Thank you. I have to buy some Jaggery. Great looking chikkis. Amma used to roll into balls. I like eating peanut brittle bar! 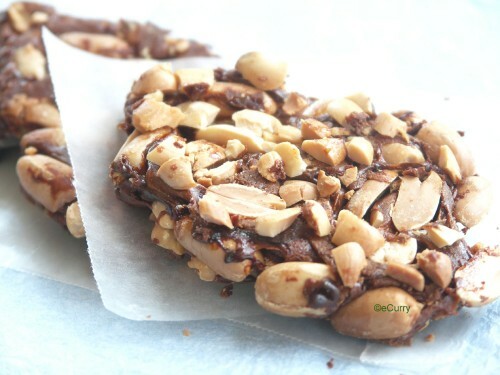 Wow chikki as we call this is my all time favourite bar….Looks yum…. Oh gosh this is a snack that I indulge in quite a lot…yours looks gorgeous. This looks lovely !! I have lots of childhood memories associated with this! peanut brittle bars look really brittle and toothsome…I just love them and can have any number. We call it chikki here ….this is the most sought after meal sweet by us when a sweet craving shoots up! it’s better than an ice-cream in calorie counts right?! ;) Thanks soma for the recipe. snaps to die for as always. Enjoy! Poila boishakher shubhecha 🙂 greetings to ur family too! This look achingly good brittle. A striking photo and a healthy snack to boot! We love love chikki at home and anything with jaggery is always welcome. I like the idea of microwaving the jaggery avialable as a big lump. I use a hammer to break it into small pieces. Microwaving is much much better. We often combine our long drive to Lonavla with getting boxfulls of these. Even though I get a painful jaw and sore teeth from these sticky things, I cannot resist them. This is amazing, what I would do for some…. This came out fabulously. Simply perfect. I love chikki. Deeba got me some and it was eaten in days!! But now I can make my own! Wonderful and thank you Soma!